Saran Jute Bags is a leading Jute Bags Manufacturer in Hyderabad, We deal with Top Quality Jute Material to manufacture Bags. We manufacture Jute Carry Bags , Jute Vegetable Bags , Jute School Bags , Jute Travel Bags , Jute File Folders , Designer Ladies Hand Bags , Lunch Bags , Water Bottle Bags , Potlis , Hand purses , Return Gift Bags , Promotional Bags , Executive Sling Bags , Laptop Bags , Executive bags etc., For more details contact us on 9866027027 , 9701000234. **For a Small Change #StopUsingPlasticbags #StartUsingJuteBags **Today's Savings is Tomorrows Earnings. #SaveEnvironment For more Latest Updates Like and Share our Facebook Page https://www.facebook.com/Saran-Jute-Bags-323575157681423/ For more Latest Updates Follow us on Twitter Page https://twitter.com/SaranJuteBags Our Products will be available at #Hyderabad #Mehdipatnam #Shilparamam #Labipet #vijayawada . Saran Jute Bags is a leading Jute Bags Manufacturer in Hyderabad, We deal with Top Quality Jute Material to manufacture Bags. We manufacture Jute Carry Bags , Jute Vegetable Bags , Jute School Bags , Jute Travel Bags , Jute File Folders , Designer Ladies Hand Bags , Lunch Bags , Water Bottle Bags , Potlis , Hand purses , Return Gift Bags , Promotional Bags , Executive Sling Bags , Laptop Bags , Executive bags etc. **For a Small Change #StopUsingPlasticbags #StartUsingJuteBags **Today's Savings is Tomorrows Earnings. #SaveEnvironment For more Latest Updates Like and Share our Facebook Page https://www.facebook.com/Saran-Jute-Bags-323575157681423/ For more Latest Updates Follow us on Twitter Page https://twitter.com/SaranJuteBags Our products will be available in #Hyderabad #Mehdipatnam #ShilparamamHyderabad #Labbipet #Vijayawada #DilipSuperMarketManikonda #Manikonda #DilipSuperMarketAlkapurTownship #AlkapurTownship #BalajiGrandBazarKondapur #BalajiGrandBazarMehdipatnam #SaranJuteBags. Saran Jute Bags is a leading Jute Bags Manufacturer in Hyderabad, We deal with Top Quality Jute Material to manufacture Bags. We manufacture Jute Carry Bags , Jute Vegetable Bags , Jute School Bags , Jute Travel Bags , Jute File Folders , Designer Ladies Hand Bags , Lunch Bags , Water Bottle Bags , Potlis , Hand purses , Return Gift Bags , Promotional Bags , Executive Sling Bags , Laptop Bags , Executive bags etc. This a Recyclable Jute Lunch Bags which are essential item. Eco-friendliness is the main feature of these bags. you can customize these bags as per your own specification. **For a Small Change #StopUsingPlasticbags #StartUsingJuteBags **Today's Savings is Tomorrows Earnings. #SaveEnvironment #SavePollution For more Latest Updates Like and Share our Facebook Page https://www.facebook.com/Saran-Jute-Bags-323575157681423/ For more Latest Updates Follow us on Twitter Page https://twitter.com/SaranJuteBags Our products will be available in #Hyderabad #Mehdipatnam #ShilparamamHyderabad #Labbipet #Vijayawada #DilipSuperMarketManikonda #Manikonda #DilipSuperMarketAlkapurTownship #AlkapurTownship #BalajiGrandBazarKondapur #BalajiGrandBazarMehdipatnam #SaranJuteBags. Saran Jute Bags is a leading Jute Bags Manufacturer in Hyderabad, We deal with Top Quality Jute Material to manufacture Bags. We manufacture Jute Carry Bags , Jute Vegetable Bags , Jute School Bags , Jute Travel Bags , Jute File Folders , Designer Ladies Hand Bags , Lunch Bags , Water Bottle Bags , Potlis , Hand purses , Return Gift Bags , Promotional Bags , Executive Sling Bags , Laptop Bags , Executive bags etc. 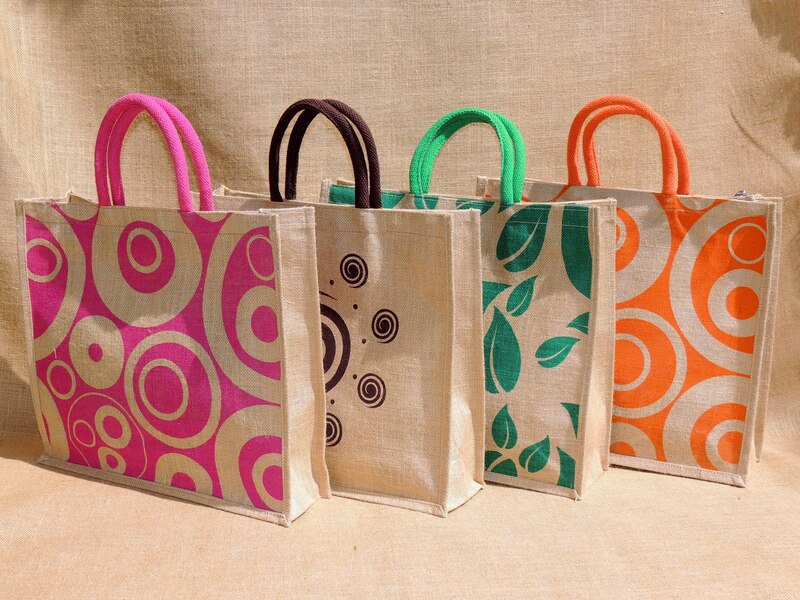 This a Recyclable Jute carry Bags which are essential item. Eco-friendliness is the main feature of these bags. you can customize these bags as per your own specification. **For a Small Change #StopUsingPlasticbags #StartUsingJuteBags **Today's Savings is Tomorrows Earnings. #SaveEnvironment #SavePollution For more Latest Updates Like and Share our Facebook Page https://www.facebook.com/Saran-Jute-Bags-323575157681423/ For more Latest Updates Follow us on Twitter Page https://twitter.com/SaranJuteBags Our products will be available in #Hyderabad #Mehdipatnam #ShilparamamHyderabad #Labbipet #Vijayawada #DilipSuperMarketManikonda #Manikonda #DilipSuperMarketAlkapurTownship #AlkapurTownship #BalajiGrandBazarKondapur #BalajiGrandBazarMehdipatnam #SaranJuteBags.